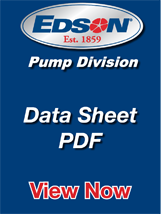 The Edson Pump Out Hose (length 50 Ft, 1.5" ID x 1.93" OD, EPDM tube with Polyethylene helix) comes complete with all fittings and adapters including 90 degree ball valve and sight glass. It's two part construction of smooth inner bore and rugged outer spiral cap provides a pump out hose that is corrosion resistant, extremely flexible, crushproof, collapse-proof and abrasive resistant. It can be used with any suction pump and at 104 degrees F has a vacuum rating of 28" Hg and pressure rating of 35 psi. Pumpout Nozzle with Splash Guard - MA Quick Clamp 1.5"
Portable Toilet Pumpout Adapter "Potty Wand"